Health officials Wednesday revised an earlier report of the dates of a Chilmark exposure to the infected child. Vaccination clinics are scheduled Wednesday and Thursday night at Martha's Vineyard Hospital. 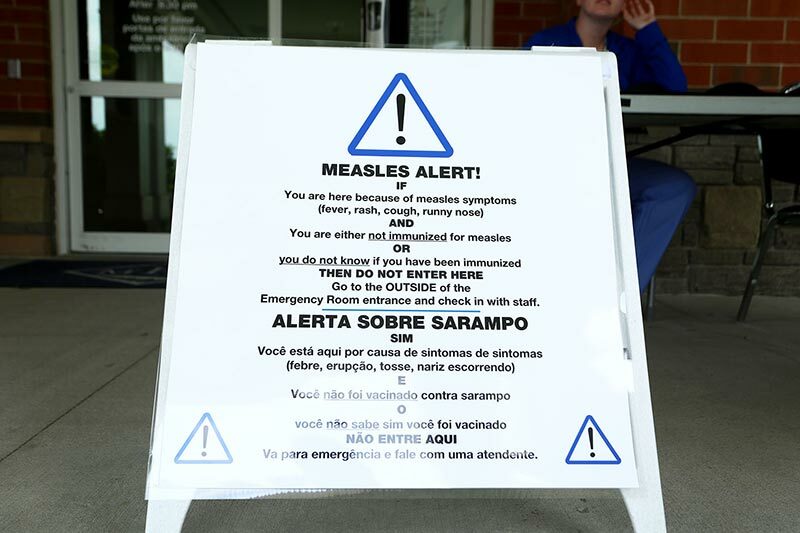 Updated 1 pm, Wednesday to correct information about two new exposure locations and the addition of a measles clinic on Thursday and the cancellation of a West Tisbury Library program. Martha’s Vineyard Hospital and state Department of Public Health (DPH) officials are working feverishly to prevent an outbreak of measles following confirmation Friday that an unvaccinated child visiting from another state and treated at the Martha’s Vineyard emergency room Wednesday night was infected with measles. Measles is a highly infectious disease, and poses a particular risk on Martha’s Vineyard, which has one of the highest rates of unvaccinated school students in the state. Martha’s Vineyard Hospital will hold a free measles immunization clinic for all ages in the doctor’s wing of the old hospital from 5 pm to 9 pm this Wednesday and Thursday. Drivers should enter by way of the Eastville entrance. If the measles vaccine is given within 72 hours of exposure, it may prevent infection, according to a hospital press release. Although the child was immediately isolated, it’s likely that other people on the Island have been exposed, the hospital said. The patient was considered infectious from Monday, June 8, through Wednesday, June 17. DPH officials spent the weekend tracking the patient’s movements. In addition to previously listed exposure sites, on Tuesday, Chilmark posted a DPH alert to the town website notifying the public that on Wednesday, June 17, the infected child visited the Chilmark School playground from 2 pm to 2:30 pm and the Chilmark Library from 2:30 pm to 5:15 pm. On Wednesday, health officials discovered that the Chilmark report of an exposure on June 17 was based on a case of mistaken identity. DPH issued a revised alert that the exposures actually occurred on Monday, June 8 from 2:30 to 5 pm. Known times and dates of verified exposures also include: West Tisbury Library, Monday, June 8, from 11 am to 3 pm; Aquinnah library Tuesday, June 9, from 3 pm to 5:30 pm, and Thursday, June 11, from 3:30 pm – 6:30 pm; Martha’s Vineyard Airport Laundromat in West Tisbury, Friday, June 12, 1 pm to 5 pm; Sharky’s Cantina in Oak Bluffs, Tuesday, June 16, 7:30 to 10:30 pm; and Ryan’s Family Amusements in Oak Bluffs, Tuesday, June 16, 5:30 to 9:30 pm. 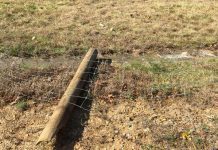 “We continue to work with the family of the individual in question, as well as local officials, to ensure that all exposure sites are properly identified and verified,” SPH spokesman Scott Zoback said. Measles is highly contagious. Symptoms include cough, high fever, runny nose, and red, watery eyes. Eventually a red blotchy rash starts on the face and spreads to the rest of the body. People with measles are infectious for four days prior to rash onset until four days after onset. Unvaccinated people usually show symptoms 10 to 14 days after exposure. Tim Walsh, hospital CEO, said one medical concern is to make sure that anyone infected with measles be directed into the hospital through a secure entrance to avoid further spreading the infection. On Saturday, a woman who had visited the hospital ER after being involved in an automobile accident last week received a telephone call from the hospital, asking her to come back to the emergency room. When she arrived, she told The Times, she was asked to put on a mask and taken into an airtight decontamination room, where she was examined for any signs of a rash and questioned by nurses and a physician. Hospital officials are urging people who think they or their children may be infected not to go to the hospital or to their doctor’s office, but to call their primary care doctor for instructions, or to contact the Massachusetts Department of Public Health at 617-983-6800, or the Martha’s Vineyard Hospital Measles Hotline at 508-957-0117. Adults are at increased risk of severe measles, and may need to be hospitalized due to complications. People who have been immunized, had measles in the past, or had blood work indicating immunity to the disease need not take action. Parents who are uncertain about the immunization of their children are urged to contact their primary care physicians. The measles virus lives in the nose and throat, and is sprayed into the air when the infected person coughs or talks. Measles can stay in the air for up to two hours after the infected person has left the room. Monday morning, Dr. Jeffrey Zack, Martha’s Vineyard Hospital Chief of Emergency Medicine, sent a letter to Island school officials to be distributed to parents, alerting them to the risk of measles. The Island boards of health have also issued a press release advising the Island public of the risks. In a press release issued Monday, the Massachusetts Department of Public Health (MDPH) said the infected child was the second confirmed case in Massachusetts this year. MDPH urged all those who do not know their measles immunization status to get vaccinated with at least one dose of MMR vaccine. Measles vaccine given within 72 hours of exposure may prevent or modify measles disease, and vaccination beyond this window will provide protection from subsequent exposures, DPH said. Data collected from school immunization surveys for the 2014–15 school year indicate higher rates of vaccine exemptions and lower rates of vaccination coverage, including MMR vaccination coverage, on Martha’s Vineyard compared with the rest of the state, DPH said. Statewide, 95 percent of kindergarteners are reported as having received 2 doses of MMR vaccine, while on Martha’s Vineyard (Dukes County), 89 percent of kindergarteners are reported as having received 2 doses of MMR vaccine, according to DPH. Those who are susceptible to measles (including the unvaccinated) who do not receive a dose of vaccine within 72 hours must be excluded from public activities, including school or work, for 21 days after an exposure, DPH said. In March, Dr. Vandana Madhavan, a pediatric infectious-disease specialist at Massachusetts General Hospital, described the importance of childhood immunizations in a presentation at the Martha’s Vineyard Hospital Health Fair. The rural isolation of Martha’s Vineyard and its attraction for tourists from around the world, coupled with the Island’s higher-than-average number of unvaccinated children, heightens the risk of a disease outbreak within the general population, she said. Her presentation on vaccines and immunizations came against the backdrop of measles outbreaks linked to visits to Disneyland last December, following years in which the disease appeared to be disappearing. Cases had become rare in the U.S. after almost 15 years of universal inoculation with the highly effective measles/mumps/rubella (MMR) vaccine. In recent years, however, some parents have chosen to delay or opt out of state-recommended vaccine schedules, based on a disproven study that linked vaccinations to autism. Measles was declared eliminated in the United States in 2000, which meant it was no longer native to the United States but continued to be brought in by international travelers. The Centers for Disease Control (CDC) reported that since 2001, the number of cases had topped 100 only five times, and there were more than 200 cases in 2011. However, the number spiked to 644 cases in 2014. In January of this year, 102 people in 14 states were reported to have contracted measles, and most of those cases were connected to a large, ongoing, multistate outbreak linked to Disneyland. Most of those cases occurred in California, and involved nonvaccinated people, according to a Reuters report published March 4. All states allow medical exemptions with strict and clear standards, such as for health conditions that would preclude vaccinations. Some, including California, also allow philosophical and religious exemptions. Mississippi and West Virginia are the only states that allow exemptions for medical reasons only. Massachusetts law requires vaccinations against 14 communicable diseases, including the MMR vaccine, as a condition of enrollment in public schools. In addition to medical exemptions, Massachusetts allows exemptions on religious grounds. On Martha’s Vineyard, approximately nine percent of parents seek and receive exemptions from vaccinations for their children, six times the state average for students entering kindergarten. The Martha’s Vineyard Public Schools granted 12 medical exemptions and 191 religious exemptions, according to statistics compiled for October 2013. School nurses are responsible for compiling vaccination data. Data provided to The Times by school nurses in 2013 revealed that the Chilmark School, Martha’s Vineyard Public Charter School, and West Tisbury School have the highest number of students exempt from vaccinations. For more isolated or rural communities such as Martha’s Vineyard, there are risks to the general population associated with parents’ choices regarding their children’s immunizations, Dr. Madhavan told The Times in March. “As under- and unvaccinated children and their families tend to cluster, communities with lower rates of immunization are more likely to experience an outbreak if there is exposure to a particular infectious disease that they are not protected against,” she said. 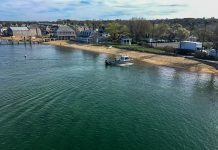 “Martha’s Vineyard has the added complication of being isolated as an island but also being quite open; travelers from all over the U.S. and the world might be at risk of exposing the population to disease,” she said. As health officials retraced the steps of the infected child, J.B. Blau, owner of Sharky’s Cantina in Oak Bluffs, took to Facebook to reassure his employees and customers that he was taking every precaution. “Last Tuesday, from 7:30 pm to 8:30 pm a child with measles dined at Sharky’s Oak Bluffs,” he said. “If you were dining there at that time and do not have the MMR vaccine, please contact your doctor. We are working with the Board of Health, and the restaurant is safe. The virus dies after 2 hours. All staff are being contacted who worked that night, and we are gathering their immunization records. He added in a later post that all his front staff were already vaccinated. “This is very good for the safety of our crew,” he said. West Tisbury library director Beth Kramer said she first heard about the measles outbreak from another librarian Sunday evening. She then contacted West Tisbury Board of Health agent John Powers. Ms. Kramer said she met twice with him Monday. In response to the health alert, Ms. Kramer cancelled Monday’s story time, as well as for the foreseeable future, she said. 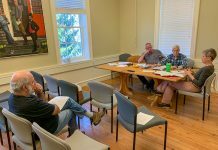 In an email to The Times late Tuesday, Ms. Kramer said the Directors of the Martha’s Vineyard Libraries decided to cancel the summer reading program kickoff event scheduled for 11 am at the Ag Hall Saturday due to the measles diagnosis. If you were born in the US before 1957, it is very likely that you are immune to measles. However, to increase the likelihood you are protected against measles, mumps, and rubella, consider receiving a dose of MMR vaccine. If you were born in the US in or after 1957, and you do not have documentation of having 2 doses of MMR or measles-containing vaccine or serologic evidence of immunity, you must receive a dose of vaccine as soon as possible. If you were born outside of the US (regardless of year of birth), and you do not have documentation of having 2 doses of MMR or measles-containing vaccine, or serologic evidence of immunity, you must receive a dose of vaccine as soon as possible. A blood test showing you are protected against measles is considered serologic evidence of immunity. However, having had the disease in the past alone is not evidence of immunity. People who are exposed to measles and who do not have evidence of immunity must get vaccinated or may have to stay home from the 5th through the 21st days after the exposure. In this situation, if you were exposed on June 17th, it means you may need to stay home from 6/22/2015 through 7/8/2015 returning to public activities on 7/9/2015. For infants who are too young to be vaccinated, they will have to remain at home during the exclusion period. For pregnant women who are unable to get vaccinated, blood work should be performed to see if they are immune. If they are NOT immune, they should contact their provider and will have to remain at home during the exclusion period. If you work or attend school in Boston please contact the Boston Public Health Commission at 617-534-5611. If you develop symptoms of measles, please stay home and call your doctor. NOTE: Before going to your healthcare provider, make sure they know in advance that you have been exposed to measles so they can ensure that other patients are not exposed when you visit. For more information contact the Department of Public Health at 617-983-6800. Information is available in Portuguese at 617-983-6800 or 888-658-2850.